Before you start, please make sure your SFDC API is turned on and you have access to it. 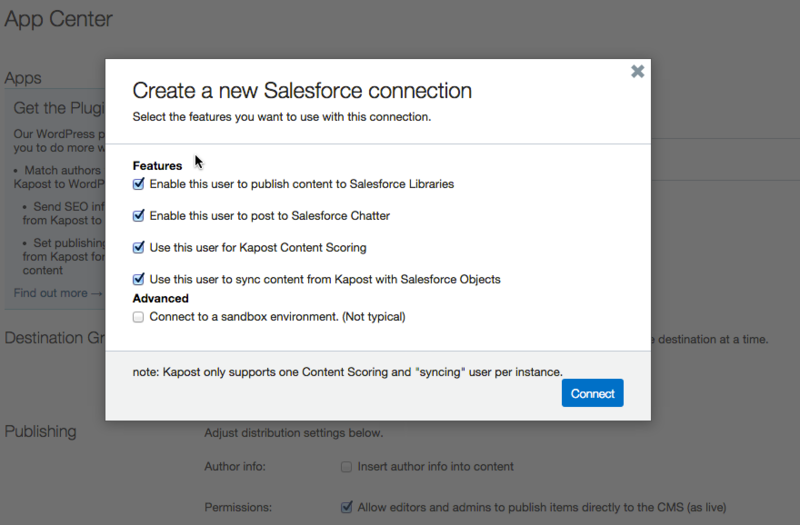 Connect Salesforce.com (SFDC) in Kapost using a user account you want to be the main connection for Kapost. This is the username will display when Content is added in the chatter messages. It's best practice to create a new user specifically for your Kapost integration, if possible. This way you can give them very specific permissions without giving them to everyone else who shares a user type. You will see a list of the different user profile types. Select the user type that corresponds to the chosen user you have chosen to integrate with Kapost. For instance, if the user you have selected is a Standard User, go to Standard User, or if they are a System Administrator click on System Administrator. Note: If you don't know your user type, you can find out by going to Users under Manage Users. The profile type will be listed in the Profile column. Once you are on the correct profile type for your chosen user, you can scroll down to Administrative Preferences and enable your API. There are two options that must be checked. If you're setting up Kapost to push to Libraries, Chatter, or Objects, continue with the steps below. The next step is to enable CRM. On the left sidebar, go to App Setup and click Customize. From the option list that appears below it, choose Salesforce CRM Content. Note: Only Admins will be able to see this step. You will be taken to the Salesforce CRM Content page. Click Edit Organization Settings. Click Edit, then check the box next to Enable Salesforce CRM Content. There is one last step to enabling CRM: Make sure your chosen user is enabled as a Salesforce CRM Content User. To do this, make sure you are logged in as your company's username and click Setup. On the left hand menu, click My Personal Information and select Personal Information from the menu below it. On that page, make sure Salesforce CRM Content User is checked off. Now you are fully configured on the Salesforce.com end. 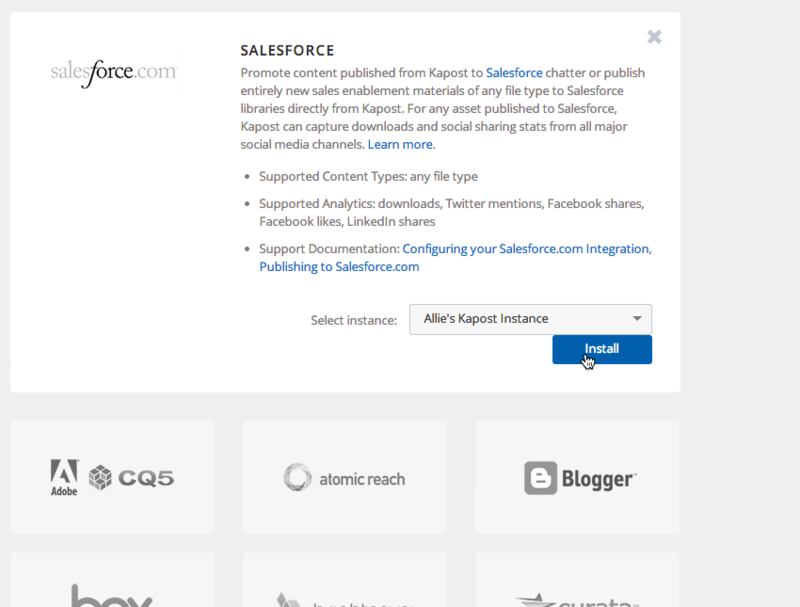 Next, you need to integrate Salesforce.com with Kapost. The first step is to log into the SFDC instance you wish to connect as the user you wish to connect to. Next, return to Kapost. Select App Center from the side navigation bar under the settings cog. Scroll down, and click Install More Apps. You will be taken to our Apps page. 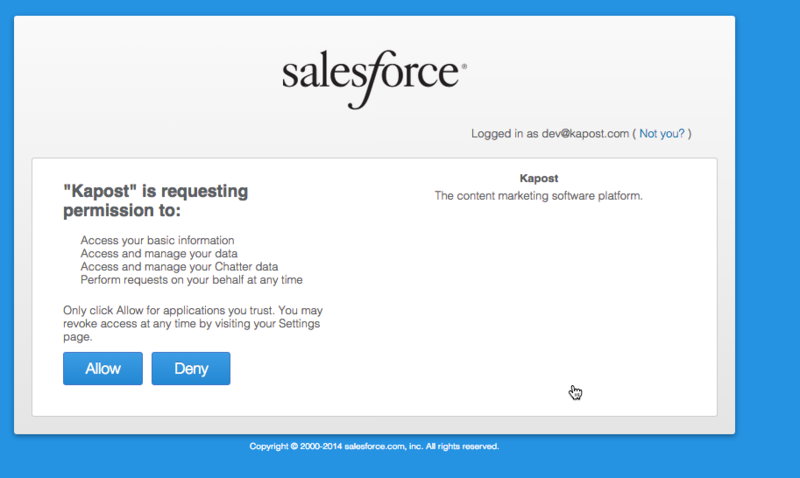 Click on the Salesforce button, and when its profile appears choose the Kapost instance you'd like to add it to, if necessary. Click Install. You will be taken back to your list of distributions. A Salesforce modal will appear asking you which features you would like to enable for this connection. It is possible to install multiple SFDC connections with different permissions. Please note, if you enable Chatter it will send the published links to your Kapost assets to Chatter by default. After you click Connect, a permissions window will pop up. Click allow. If you selected Libraries as an available feature, choose which libraries you would like to connect to. You will now have to associate this connection as a primary destination for a File content type. Or, you can associate this connection as a promotion destination for blog posts and file content types.